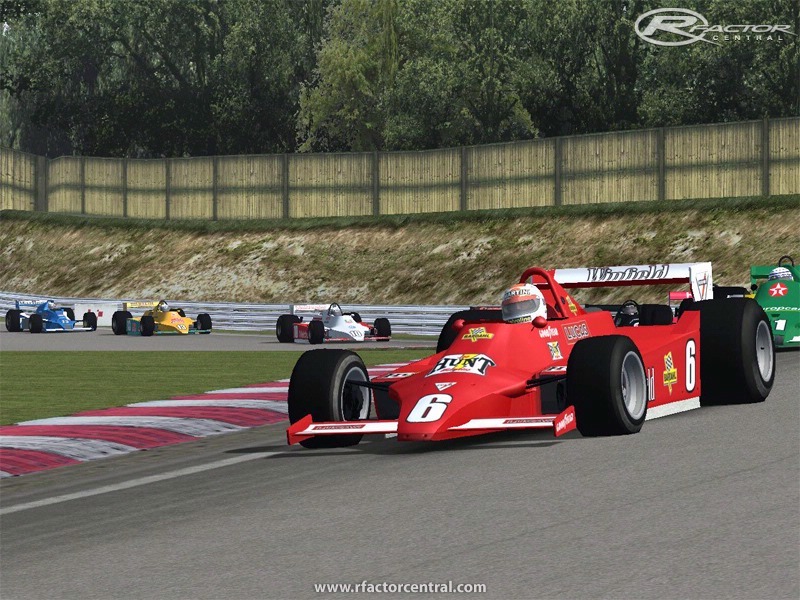 Aurora 1979 1.0 mod for rFactor. Extract the archive content in your rFactor folder. The GPC79 2.01 mod is required before installing this mod. You can find it here at RFC. WARNING : Make sure you have the 2.01 version, you'll get no sound if you only have the 2.0 version. This mod tries to be as close as possible from the 1979 season of the Aurora Series. The present chassis are either exactly those of this season (Arrows A1, Williams FW06, Fittipaldi F5A, Shadow DN9), either those which are as close as possible (Lotus 79 = Lotus 78, Wolf WR8 = Wolf WR4, Tyrrell 009 = Tyrrell 008, Mclaren M28 = Mclaren M26). Car performances have been adjusted in consequence. So, the Lotus 79 and the Arrows A1 are the fastest cars of the field and have identical potential. The Wolf WR8 is a bit slower but it is a fairly good car. Behind them, the Fittipaldi F5A and Tyrrell 009 are average cars and have the same perfomances. The Williams FW06 performances depends on the type of track. It can be quite good and fun to drive on slow tracks but it will really struggle in fast curves. And finally, the Mclaren M28 and the Shadow DN9 are both the slowest cars of the grid. They will lose time particulary in long and fast corners. But the performance gap between the fastest cars and the slowest is still quite close, it may vary between one and 2 seconds, depending on the type of track. All those cars share the same engine, a Ford Cosworth V8 coming from Formula 1, but less powerfull. They all use the same brand of tyres, less efficient than in Formula 1, and harder. They will cover a 1 hour race without any problem. No qualification tyres, as teams didn't have enough money to buy them at this time. Having only a few pics of this series, and those cars being extremely hard to paint, most of the skins are fictionnal. That's why the mod is not described as "Real World". Thanks to MotorFX for allowing me to use 3D models from the GPC 79 mod, and thanks to the whole GPC crew for their work on this mod. 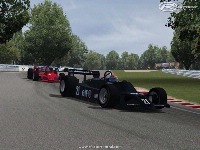 Mod Aurora 1979 1.0 pour rFactor. Extraire le contenu de l'archive dans votre dossier rFactor. Vous devez avoir le mod GPC1979 2.01 installé au préalable. Le mod essaye de se rapprocher de la saison 1979 du championnat Aurora AFX. Les châssis présents sont soit exactement ceux d'époque (Arrows A1, Williams FW06, Fittipaldi F5A, Shadow DN9), soit ceux qui s'en rapprochaient le plus (Lotus 79 = Lotus 78, Wolf WR8 = Wolf WR4, Tyrrell 009 = Tyrrell 008, Mclaren M28 = Mclaren M26). Les performances ont été ajustées en conséquences, pour coller aux résultats de la saison. Ainsi, la Lotus 79 et l'Arrows A1 sont les meilleures châssis du jeu et leurs performances sont identiques. La Wolf WR8 est un peu en retrait mais toujours assez efficace. Derrière elles on retrouve Fittipaldi F5A et Tyrrell 009 qui sont des voitures moyennes, aux performances identiques. La Williams FW06 est plus aléatoire dans ses performances, elle peut être tout à faire correcte sur des circuits lents mais vraiment en difficulté dans les circuits combinant des courbes rapides. Enfin Shadow DN9 et Mclaren M28 sont les voitures les plus lentes, qui souffrent particulièrement dans les virages rapides. Mais l'écart de performance entre les meilleurs châssis et les moins bons reste assez faible, allant d'une seconde à 2 secondes suivant les circuits. Toutes ces voitures partagent le même moteur, un Ford Cosworth V8 issu de la Formule 1, mais moins puissant. De même elles utilisent toutes les mêmes pneus, moins performant qu'en Formule 1, et plus durs. Ils permettent sans soucis de couvrir une course d'une heure. Pas de pneus de qualifications, les écuries de l'époque n'avaient pas les moyens d'en acquérir. Ne disposant que de très peu de photos de ce championnat, et ces voitures étant extrêmement difficiles à peindre, la majorité des skins sont fictifs. C'est pourquoi ce mod n'est pas classé dans "Real World". Physiques, Renato Simioni (un peu retouchées). There are currently no setups for Aurora 1979. Add a Setup. There are currently no car skins available for Aurora 1979. If you are a painter you can share skins for this mod via the Car Skins area. Visit the Spray Booth for painting tips & tricks. I stand corrected. I can't remember where I got the oil company bit from, and now can't find any reference, so it was probably the slot cars. Excellent mod, just need to remember to warm those tyres. As Cornelius says, Aurora was indeed the sponsor. I think it was Aurora AFX slotcars though rather than the oil company. I love the GP'79 mod, but I think the less commited driver will love these, and I believe more experienced drivers should give them a chance, there's a lot to like. Congratulations to the devs, losing a little bit of power, harder tyres that slide progressively when warm, and getting rid of the stiffest, highest downforce ground effect cars makes this mod very approachable, whilst the cars are more than decently quick I've only turned some laps on Donington so far, but the results are excellent. For those days when I don't want the full blood and thunder GP'79, these are really nice to drive and reflect the last regular national level F1 competition in the UK. 'Aurora' was the British Formula 1 Championship, which ran for four years in the late seventies and early eighties, mostly in second-hand F1 World Championship cars. For three of the four years it was backed by the Aurora oil company, hence the name. It's got an entry in Wikipedia, if you're interested. Hey, nice looking mod. Not being funny but I may have missed something. What is "aurora." 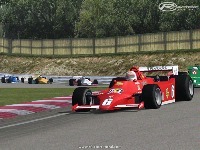 Is this mod not just like the '79 F1 mod?? weir, if i launc rfactor with this mod as last used, i've got engine sounds, if i switch from another mod from user setting i don't have any. Anyway an amzing job! Yes that works but you'll get a rfm mismatch online. Install the 2.01 patch for the GPC79 mod and it should be ok.
in the ConfigOverrides section of the rfm. Adding it fixed the sound problem. Very nice mod once I got the sound going, thank you! Adding this line worked for me, too. Thanks a lot.